2. Roll it. Bring the two outer edges together so it makes a little roll, one you could breath through. Make sure it is sticking out of your mouth. 3. Push forward your chin so your bottom lip pushes up ever so slightly. 4. 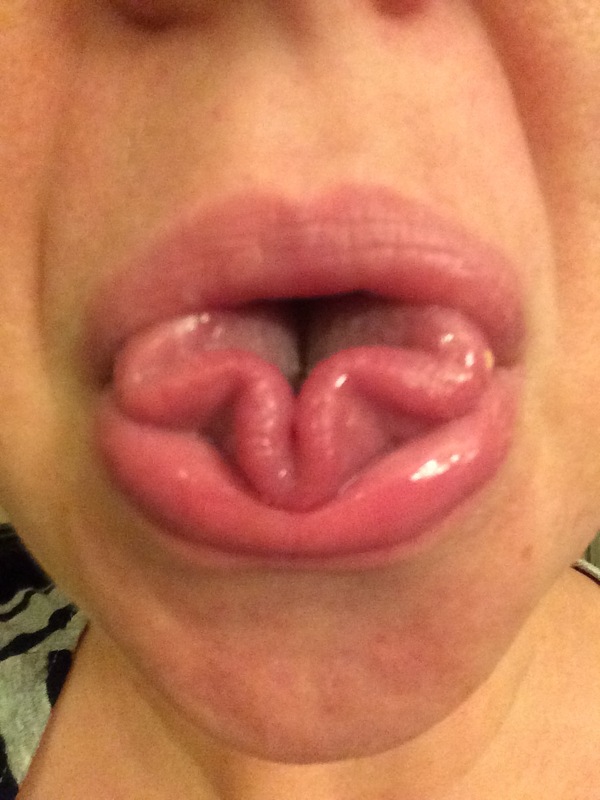 Sink your tongue roll into the little space created by pushing your chin out. 5. Allow parts of the tongue to fold in. You have made a three leaf clover with your tongue! Next ›Are You An Ear Hustler? I’m very relieved I wasn’t on camera in Skype as I tried that. Do you know if neither of your parents can roll their tongue you can’t either? It is genetic. Yes, I can!!!! Bwa-ha-ha! I was a little worried about posting the picture, but blogging is supposed to push my boundaries, right? Cohiba can’t roll his tongue, so will have to see if Wee One can do it. I’m impressed if that is your tongue…Very nice one!! Not to mention how talented it is. This looks sooo easy… But not all tongues seem to want to cooperate? I’ve heard it’s genetic. 😀 But I love that you tried! !